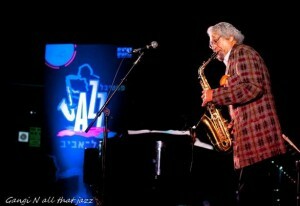 Diverse and eclectic, Gary Bartz is undeniably one of music’s most prolific performers. Getting his big break as guest-saxophonist in Art Blakely’s band, Bartz went on to establish his own avant-garde jazz group called Ntu Troop, which combined African, soul and funk. 40 solo albums, 200 collaborations and a Grammy later (in 2005 as part of McCoy Tyner’s album Illuminations – another jazz great to have graced Israeli stages in recent years) Bartz is a 73-year-old living legend, charismatic and talented as ever. Notoriously skeptical of definitions and titles – “I don’t play jazz, I play music” – Bartz and his ensemble put on a fantastical jubilee of sounds, patterns, harmonies and solos that exuded experience and nearly impeccable musical chemistry. The quartet, including Jimmy King on contrabass, the totally groovy Greg Bandy on drums, and the exceptional Barney Mcall on piano, have been playing together for nearly a decade. Rarely have I seen an ensemble be so flawlessly in tune with one another, both musically and emotionally. Beyond being each phenomenal musicians in their own right – displayed by generous solos and whimsical improvisations – together the quartet serves as a reminder of the power of experience and communication. “We’re musical scientists”, muses Bartz to the earnest crowd. “And this is our lab”. Endearingly closing his show with a dedication of the Sun Song to Israel (“You have a lot of sun!”), Bartz and his quartet left a sweet taste in the mouths of old and dedicated fans.